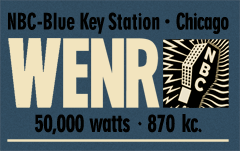 NBC Blue Key Station WENR, Chicago, produced and broadcast Lights Out! throughout the Wyllis Cooper-written run. 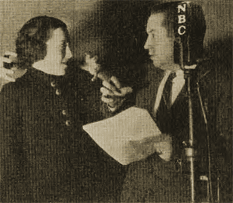 Betty Winkler cowers before Ted Maxwell's clutched hand. LIGHTS OUT, Everybody." A deep voice speaks softly. Thirteen chimes . . . Evil omen. Wind rising to a crescendo and fading . . . ominous--forboding. By the time this much of the Lights Out program has gone out over the air hundreds of thousands of listeners, literally in the four corners of the country, are sitting in the dark, nerves taut in anticipation. Then the play. Whatever its story, it must be gory, blood-curdling, terrifying. It had better be, or Willis Cooper, creator and author of the program and Western NBC continuity editor, will be deluged with letters calling him "sissy." Lights Out fans want their horror undiluted. And they get what they want--or else. Which means that by letter, phone and telegram they shout long and loudly until they do get what they want. NBC found that out when the program was taken off the air last Winter. THE program started as a novelty--an experiment. Its immediate, overwhelming success probably will make it Exhibit A for all those who insist that listeners do know what they want from their radios, and will emphatically voice their approval when given an incentive. 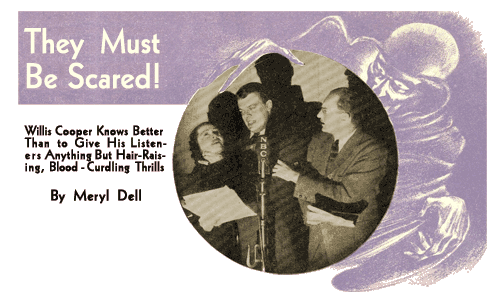 About a year and a half ago it occurred to Willis Cooper that a great many listeners might welcome a dramatic show late at night as relief from the constant song of dance ballads. Being an avid reader of mystery and horror stories, especially as relaxation after a hard day's work, he decided quite naturally that midnight and ghastly stories would make a grand combination for night-owl listeners. Whereupon Mr. Cooper spent a few evenings giving himself the jitters by writing tales of horror intead of reading them. That's no gag. With that vivid imagination of his . . . you know he has to have one to write those chilling tales . . . he sometimes scares himself so he has to stop writing in the middle of a story, and finish it the next day. Especially is this so of ghost stories. Bill is scared to death of ghosts; so much so that often he refuses to listen when one of his ghost stories is being broadcast. "I just can't take it," he admits. 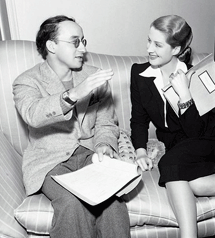 He presented his scripts and suggestions for midnight dramas to NBC's program board. Only mildly interested, the others on the board--Cooper himself is one of them--bowed to their continuity editor's enthusiasm and decided the idea was worth giving a trial. 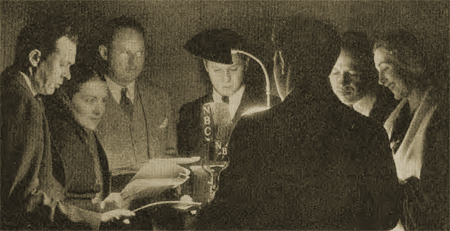 Without ballyhoo of any kind, Lights Out was presented for the first time over WENR on a Wednesday at midnight early in January, 1934. The studio personnel, accustomed to all types of programs and therefore generally indifferent to all, started staying up late on Wednesday nights. A few radio editors paid tribute to something new on the air. Letters from listeners startted to come in, slowly but surely increasing in number each week. It was evident that Lights Out was a successful experiment. But no one, not even Willis Cooper, imagined that it was a sensation. THAT amazing revelation came months later. As continuity editor, Bill had a great deal of work to do. He decided he needed for his other work the time it took to write Lights Out. One night last January the announcer ended the program with a simple announcement: "This is the last of the series of Lights Out programs." Then came the deluge. From North, East, South and West came letters, phone calls, telegram, petitions--some signed by as many as 200 people. Radio editors were swamped with protesting mail from their readers. The mailing room was flooded. "Put Lights Out back on the air!" was the cry. It wasn't a plea. It was a demand. "You can't take Lights Out away from us" was the ultimatum laid down by the worlds greatest dictator--the public. Sweet music to an author's ears. Pleasant surprise for the network. With such acclaim, Cooper didn't care how much extra work he had to do. What writer would? THREE weeks later, Lights Out was back on WENR each Wednesday at midnight. 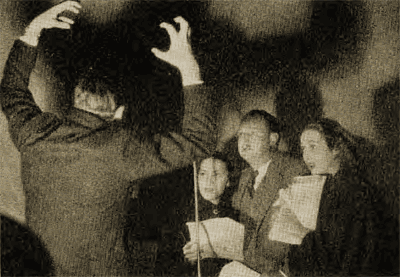 And shortly afterward, yielding to the demands of station managers whose listeners were clamoring for Lights Out, the program was scheduled for the entire network. To save Eastern listeners the necessity of staying up all night to hear the program--blase New York had been particularly emphatic in demanding the thriller for its supposedly sated listeners--the program is now being broadcast half an hour earlier, at 12:30 a. m. EDT. Watching a Lights Out broadcast is an experience in itself. As the opening words are spoken, all studio lights are extinguished. Working in utter darkness excepting the pin point of light that enables the actors to see their scripts, and another in the control room so they can watch the program's producer, everyone becomes tense. A huge studio in almost total darkness and silence is not the most cheerful place to be, even if you know it is just a play going on. At a sign from the production man, the play starts. You keep reminding yourself that this is only a radio program, try to force yourself to be cool and unconcerned. After all, it's only a play and there are the actors in front of you; but so realistic is the acting--the atmosphere--the sounds--that cold chills insist upon running up and down your spine. The program is over. Lights go on. With a sigh of relief you silently breathe thanks that no one was around to see you jitter. It seems silly to get scared watching a broadcast. BUT it isn't silly. It is a great tribute to those who are responsible for the program--the production man, the actors, the engineer and the sound men. Under the sensitive dircction of Ted Sherdeman, the program's producer, the actors actually live the experiences written in Cooper's lines; sound and action are so real that one loses all sense of listening to a program; one seems actually to be witnessing a living drama. So intensely real is the drama that it sends shudders through thousands of people many miles away, and keeps the illusion of reality even in the studio. Audiences are not permitted at Lights Out broadcasts; but unlike many programs, it would spoil no listener's illusions if they were. Some of Chicago's finest actors and actresses take part in the Lights Out shows. 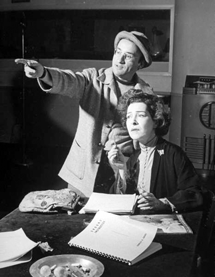 Betty Winkler and Bernardine Flynn share the feminine parts; Arthur Jacobson, Don Briggs, Sydney Ellstrom, Phillip Lord, Ted Maxwell and Butler Mandderville are the stock group from which each weeks male cast is chosen. LIGHTS OUT mail is prohably the most interesting received by any program. From all walks of life, from nearly every state in the Union, and from half a dozen countries, it pours in every week. So varied is its source, seemingly encompassing every type and class of people, that one is struck by the thought that if there is such a thing as a universal type of entertainment . . . a type to please all tastes . . . Lights Out is it. There are at least 200 Lights Out clubs, composed of from four to as many as fifty members. They meet each Wednesday evening to play cards or dance until time for the program's broadcast. Each of these, as well as hundreds of other listeners sends in a weekly comment. "And woe is me," says Bill, "if the story has been even a litlle milder than usual. Those blood·thirsty fans pounce on me like some of my characters do their victims. Gives me nightmares." But don't take that too seriously. Actually, Bill gets a kick out of writing his Lights Out--and a real thrill from those fan letters. Lights Out may be heard Wednesday over an NBC-WEAF network at 12:30 a. m. EDT (11:30 p.m EST; 11 :30 CDT; 10:30 CST; 9:30 MST; 8:30 PST). Lights Out! Director Art Jacobsen instills the perfect emotional feeling for another Wyllis Cooper script performed by Betty Winkler, Sid Ellstrom and Helen Fox. Let's all sit down and have a good scare. At exactly half an hour past midnight (EST), tonight, lights will be dimmed in innumerable homes throughout the nation, armchairs will be dragged closer to radios, books and papers will be laid aside, and a shudder will pass over the face of the land, for Boris Karloff, the best known bogeyman in the movies, will be undertaking a role in "Lights Out"--the best known horror drama in radio. His first midnight horror, tonight, will be "Cat-Wife," with Betty Winkler as the neurotic wife. Fear, you know, is a funny thing. We talk bravely about rooting it out of our minds and banishing it from our lives, but the truth of the matter is that we probably wouldn't if we could, for we really enjoy it. We have an appetite for fear. Boris Karloff in his first appearance on the "Lights Out" show may be heard over station WBEN at 12:30 a.m.
Ted Sherdeman, Wyllis Cooper, Arch ObolerAlbert Crews, Bill Lawrence, Herbert Swope Jr.
Art Jacobsen, Lou Robertson, Laurence Schwab Jr.
12.00  Lights Out! mystery drama. . . . . Thanks are due Bill Cooper, who is the producer of those extraordinary Midnight Mysteries heard from WENR every Wednesday, at midnight. Lights out, everybody, torn guaranteed thrill! . . . . LIGHTS OUT!Listen in the darkIf you dare! to Bill Cooper's supernatural dramaLast time we mentioned it in this column, Lights Out was scaring folks lor only 15 minutss over WENRNow you can be scared for a half-hour over a network of NBC stations! at 11 p.m.
NO DOUBT A GOOD MANY readers of this column have become acquainted with Lights Out, the intriguing supernatural stuff that has been emanating from WENR Wednesday nights for several months past. If you haven't, you've been passing up one of the most cleverly produced dramatic shows on the air today. 11:00--WENR--Henry Busse's orchestra; WMAQ--King's Jesters. 37-09-29 Chicago Daily Tribune - 11:30--WMAQ--Lights Out--"Glacier Woman." 37-10-06 Chicago Daily Tribune - 11:30--WENR--Lights Out--"The Escape." 37-11-03 Chicago Daily Tribune - 11:30--WENR--Lights Out--"Four Husbands." 37-11-17 Chicago Daily Tribune - 11:30--WCFL--Lights Out: "Little Old Lady." 37-11-24 Chicago Daily Tribune - 11:30--WCFL--Lights Out--"Tin Soldier." 37-12-01 Chicago Daily Tribune - 11:30--WCFL--Lights Out--"Death Pit." 37-12-22 Chicago Daily Tribune - 11:30--WCFL--Lights Out--"Uninhabited." 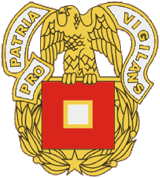 38-01-05 Wisconsin State Journal - 11:30 p.m.--Lights Out (WIBA, WMAQ): "Ghengis Khan." 38-01-19 Wisconsin State Journal - 11:30 p.m.--Lights Out (WIBA): dramatizes Arch Oboler's "The Seventh Woman", a tale of a hotel room. 38-02-02 Wisconsin State Journal - 11:30 p.m.--Lights Out (WIBA): "Death Letter." 38-02-09 Wisconsin State Journal - 11:30 p.m.--Lights Out (WIBA, WMAQ): story of movie actor, seven mysterious old women in out-of-the-way hotel. 38-02-16 Wisconsin State Journal - 11:30 p.m.--Lights Out (WIBA, WMAQ): Chicago's murder castle. 38-02-23 Wisconsin State Journal - 11:30 p.m.--Lights Out (WIBA, WMAQ): story of a world-dooming "Chicken Heart." 38-03-02 Wisconsin State Journal - 11:30 p.m.--Lights Out (WIBA, WMAQ): "Mother-in-Law." 38-03-03 Saratoga Springs Saratogian - Boris Karloff, eerie actor of the screen, now is to become a "horror" actor of the microphone. Effective Mar. 23 he is to join the Lights Out mystery thrillers of WEAF-NBC for a series of five appearances. Arch Oboler, author of the mystery tales, is writing special scripts for Karloff. "Lights Out" is now in its fifth year. 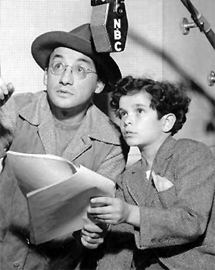 38-03-09 Wisconsin State Journal - 11:30 p.m.--Lights Out (WIBA, WMAQ): weird adventures of two boys in Paris. 38-03-16 Wisconsin State Journal - 11:30 p.m.--Lights Out (WIBA, WMAQ): "Super Feature"--tale of a killer and his dupe. 11:30 p.m.--Lights Out (WIBA, WMAQ): Boris Karloff in "The Dream." Boris Karloff, Best of the Bogeymen, To Appear on 'Lights Out' Show - Let's all sit down and have a good scare. At exactly half an hour past midnight (EST), tonight, lights will be dimmed in innumerable homes throughout the nation, armchairs will be dragged closer to radios, books and papers will be laid aside, and a shudder will pass over the face of the land, for Boris Karloff, the best known bogeyman in the movies, will be undertaking a role in "Lights Out"--the best known horror drama in radio. His first midnight horror, tonight, will be "Cat-Wife," with Betty Winkler as the neurotic wife. Fear, you know, is a funny thing. We talk bravely about rooting it out of our minds and banishing it from our lives, but the truth of the matter is that we probably wouldn't if we could, for we really enjoy it. We have an appetite for fear. Boris Karloff in his first appearance on the "Lights Out" show may be heard over station WBEN at 12:30 a.m.
"Lights Out"-NBC-Red, 12:30 a.m. EST. (For the West, 10:30 p.m. PST.) Kadoff, best known for his "monster" roles in the movies. begins a five-week series of broadcasts as star of radio's greatest horror show-"Lights Out:' His first horror program will be "Cat-Wife," with Betty Winkler as the neurotic wife. 38-03-30 Wisconsin State Journal - 11:30 p.m.--Lights Out (WIBA, WMAQ): "Valse Triste," with Boris Karloff. 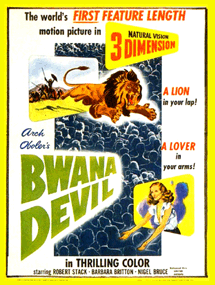 38-04-06 Wisconsin State Journal - 11:30 p.m.--Lights Out (WIBA, WMAQ): Boris Karloff in "Cat Wife." 38-04-13 Wisconsin State Journal - 11:30 p.m.--Lights Out (WIBA, WMAQ): "Three Matches." 38-04-20 Wisconsin State Journal - 11:30 p.m.--Lights Out (WIBA, WMAQ): Boris Karloff in "Night on the Mountain." 38-04-27 Wisconsin State Journal - 10:30 p.m.--Lights Out (WIBA): Arch Oboler dreams "They Died" so you can go to bed and have nightmares. 38-05-04 Wisconsin State Journal - 10:30 p.m.--Lights Out (WMAQ): "Devil's Island." 38-05-11 Wisconsin State Journal - 10:30 p.m.--Lights Out (WMAQ): "It Happened" in the sewers of Paris (on WIBA at 10:35). 38-05-18 Wisconsin State Journal - 10:30 p.m.--Lights Out (WMAQ): "Good, Bad, Indifferent." 10:30 p.m.--Lights Out (WMAQ): "Mrs. Crazy." 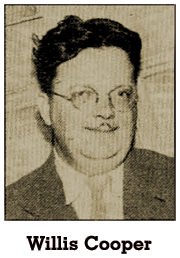 38-10-05 Wisconsin State Journal - WIBA 11:30--NBC Savoy Ballroom Orchestra; WMAQ Earl Hines Orch. 38-10-12 Wisconsin State Journal - 11:30 p.m.--Lights Out (WIBA, WMAQ): returns with "Homecoming." 38-10-19 Wisconsin State Journal - One of the most solemn moments of the current eucharistic congress in New Orleans, the holy hour and benediction of the blessed sacrement, will be broadcast at 11 tonight by NBC-WIBA. The mediations will be given by Archbishop John Murray, St. Paul, and the benediction will be celebrated by the Most Rev. Stephen Donohue, administrator of the archdiocese of New York. 38-10-26 Wisconsin State Journal - 11:30 p.m.--Lights Out (WIBA): "Ghost Operator." 38-11-02 Wisconsin State Journal - 11:30 p.m.--Lights Out (WIBA): the story of "Living Death" in a coffin. 38-11-09 Wisconsin State Journal - 11:30 p.m.--Lights Out (WIBA): "The Legion of the Dead" for Armistice day memories. 38-12-07 Wisconsin State Journal - 11:30 p.m.--Lights Out, WMAQ. 38-12-14 Wisconsin State Journal - 11:30 p.m.--Lights Out (WIBA): "Queen Cobra", the story of a scientist who goes to India. 38-12-21 Wisconsin State Journal - 11:30 p.m.--Lights Out (WIBA, WMAQ): a story of re-incarnation during the war. 38-12-28 Wisconsin State Journal - 11:30 p.m.--Lights Out (WIBA, WMAQ): "The Theater", a story of inheritance. 39-01-04 Wisconsin State Journal - 11:30 p.m.--Lights Out (WIBA, WMAQ): "The Cat Pit." 39-01-18 Wisconsin State Journal - 11:30 p.m.--Lights Out (WIBA, WMAQ): "The Stage Is Set for Murder," melodrama about a mad magician. 39-02-01 Wisconsin State Journal - 11:30 p.m.--Lights Out (WMAQ, WIBA): an unannounced thriller. 39-02-08 Wisconsin State Journal - 11:30 p.m.--Lights Out (WIBA, WMAQ): "The Living Dead." 39-02-15 Wisconsin State Journal - 11:30 p.m.--Lights Out (WIBA, WMAQ): "Jericho," the tale of the stolen disintegrator. 39-02-22 Wisconsin State Journal - 11:30 p.m.--Lights Out (WIBA, WMAQ): "The Survivor"--story of sailor who survives a fire at sea. 39-03-01 Wisconsin State Journal - 11:30 p.m.--Lights Out (WIBA, WMAQ): "Satan's Orchid." 39-03-08 Wisconsin State Journal - 11:30 p.m.--Lights Out (WIBA, WMAQ): "One Day It Rained Blood," the story of the last man on earth. 39-03-22 Wisconsin State Journal - 11:30 p.m.--Lights Out (WIBA, WMAQ): "Dilu"--a play of the spirit world. 39-04-26 Wisconsin State Journal - 11:30 p.m.--Lights Out (WIBA, WMAQ): June Travis in "The Devil's Due." 39-05-24 Wisconsin State Journal - 11:30 p.m.--Lights Out (WIBA, WMAQ): "Beetles"--as large as men. 39-06-14 Wisconsin State Journal - 11:30 p.m.--Lights Out (WIBA, WMAQ): with Betty Winkler as the voice of an alley-cat. 39-06-28 Wisconsin State Journal - 11:30 p.m.--Lights Out (WIBA, WMAQ): "Macbeth." 39-07-19 Wisconsin State Journal - 11:30 p.m.--Lights Out (WIBA, WMAQ): results of a collego boy's prank. 39-07-26 Wisconsin State Journal - 11:30 p.m.--Lights Out (WIBA, WMAQ): "The Giggler," storyof insane man who, by surgery, changes enemies' characteristics. 39-08-16 Wisconsin State Journal - 11:30 p.m.--Lights Out (WIBA, WMAQ): "The Day of Four," story woven around Aztec ruins. 42-10-06 Wisconsin State Journal - 7 p.m.--Lights Out (WBBM): Arch Oboler's series, opening with "What the Devil"--story of two runaways blocked by a dynamite truck. 42-10-13 Wisconsin State Journal - 7 p.m.--Lights Out (WBBM): "Revolt of the Worms." 42-10-20 Wisconsin State Journal - 7 p.m.--Lights Out (WBBM): story of a "poltergeist." 42-10-20 New York Times - Lights Out Drama: "Poltergeist"--WABC, 8-8:30. 42-10-27 Wisconsin State Journal - 7:00 Lights Out--WBBM WCCO 42-10-27 New York Times - Lights Out Drama: "Mungahra"--WABC, 8-8:30. 42-11-03 Wisconsin State Journal - 7 p.m.--Lights Out (WBBM): "Across the Gap," glimpse of the future. 42-11-10 New York Times - Lights Out Drama: "Bon Voyage"--WABC, 8-8:30. 42-11-17 Wisconsin State Journal - 7 p.m.--Lights Out (WBBM): "Come to the Bank." 42-11-24 Wisconsin State Journal - 7 p.m.--Lights Out (WBBM): "Chicken Heart," story of heart in a glass case. 42-12-01 Wisconsin State Journal - 7 p.m.--Lights Out (WBBM): "Mr. Maggs," who finds a coffin in his garden. 42-12-08 Wisconsin State Journal - 7 p.m.--Lights Out (WBBM): columnist commits suicide, returns to haunt his publisher. 42-12-08 New York Times - Lights Out Drama: "Scoope"--WABC, 8-8:30. 42-12-15 Wisconsin State Journal - 7 p.m.--Lights Out (WBBM): "Knock at the Door," in which a corpse refuses to stay dead. 42-12-22 Wisconsin State Journal - 7 p.m.--Lights Out (WBBM): "The Miracle." 42-12-22 New York Times - Lights Out Drama: "Meteor Man"--WABC, 8-8:30. 42-12-29 Wisconsin State Journal - 7 p.m.--Lights Out (WBBM): "Valse Triste." 43-01-05 Wisconsin State Journal - 7 p.m.--Lights Out (WBBM): "The Fast One," story of a criminal who moves with the speed of light. 7 p.m.--Lights Out (WBBM): "The Mirror," defense of movie press agent. 7 p.m.--Lights Out (WBBM): spiteful woman becomes a cat. 43-01-19 New York Times - Lights Out Drama: "Catwife"--WABC, 8-8:30. 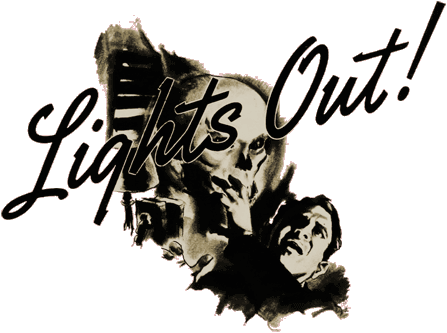 7 p.m.--Lights Out (WBBM): "Until Dead" starring Nancy Carroll's daughter, Patricia Kirkland. Announcing . . . Arch Oboler's Lights Out starts the ball rolling at 8 o'clock over WKBW, tonight's play being Until Dead, wherein a husband tries to avenge the murder of his wife. 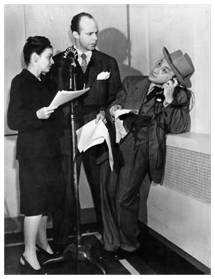 The Oboler plays are easily the wildest fantasy to be heard on the air, but are so marked by good production and performance as to be most entertaining. 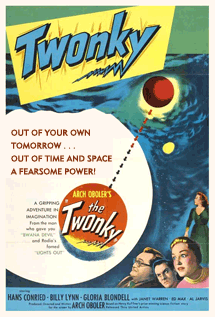 7 p.m.--Lights Out (WBBM): "He Dug It Up"--a charming old pre-war Englishman finds a coffin in his garden. 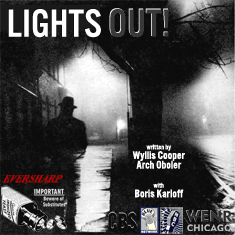 7 p.m.--Lights Out (WBBM): "Oxychloride X," in which a trivial event changes history. 43-02-23 Wisconsin State Journal - 7 p.m.--Lights Out (WBBM): "They Met at Dorset," the attempt of two Nazis to rescue Rudolph Hess. 43-03-02 Wisconsin State Journal - 7:00 Lights Out--WBBM WCCO 43-03-02 Lowell Sun - LIGHTS OUT Drama: "The Sea," :WEEI, 8 to 8:30. 43-03-09 Wisconsin State Journal - 7 p.m.--Lights Out (WBBM): "The Ball," tale of two college sophomores looking for the Paris of artists and models. 43-03-16 Wisconsin State Journal - 7 p.m.--Lights Out (WBBM): "The Dream," a fantastic story of a dream within a dream. 43-03-23 Wisconsin State Journal - 7 p.m.--Lights Out (WBBM): "The Flame," the relation of a match flame to the death of two men. 43-03-30 Wisconsin State Journal - 7 p.m.--Lights Out (WBBM): "Money, Money, Money," tale of two men, one who wanted money for unselfish reasons and the other who wanted money for its own sake. 43-04-06 Wisconsin State Journal - 7 p.m.--Lights Out (WBBM): "Superfeature." 43-04-13 Wisconsin State Journal - 7 p.m.--Lights Out (WBBM): "Archer," three kidnapers and a girl. 43-04-20 Wisconsin State Journal - 7 p.m.--Lights Out (WBBM): "Kill," a dramatic probe into the subconscious. 43-04-27 Wisconsin State Journal - 7:00 Lights Out--WBBM WCCO LIGHTS OUT DRAMA: "Execution," anti-Nazi play; WEEI, 8 to 8:30. 43-05-04 Wisconsin State Journal - 7 p.m.--Lights Out (WBBM): "Heavenly Jeep," a ride through Tunisian minefields. 43-05-11 Wisconsin State Journal - 7:15 p.m.--Lights Out (WBBM): "Murder in the Script Department." 43-05-18 Wisconsin State Journal - 7 p.m.--Lights Out (WBBM): "The Spider." 43-05-25 Wisconsin State Journal - 7 p.m.--Lights Out (WBBM): "Little Old Lady"--dead three years. 43-06-01 Wisconsin State Journal - 7 p.m.--Lights Out (WBBM): "The Ugliest Man in the World." Boris Karloff, Frankenstein monster of the screen, was the inspiration for "The Ugliest Man In the World," premiere production of Arch Oboler's Plays, new series of original dramas of the fantastic and of hte imagination to be produced by NBC. The play will be broadcast over WEAF Saturday at 10 p.m. Two years ago Karloff and Oboler were drawn together in NBC's Midnight thrillers, "Lights Out." 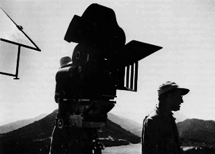 Karloff was starring in the spine-tingling productions and Oboler was then writing them. One day the two sat down at lunch and discussed the many distorted-faced characters Karloff had portrayed on the screen. 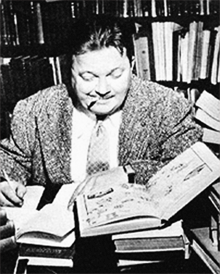 "That was the beginning of 'The Ugliest Man in the World'," Oboler explained. "But don't misunderstand me. Boris himself is one of the handsomest men in the world in a virile way, but these ugly monster roles set me to thinking. What would happen to the man who was so ugly that children would scream in fright when they saw him, who was such a shocking spectacle that even his mother's life became unbearably unhappy? How would such a man react to people and to love? What childhood would he have?" 43-06-08 New York Times - Lights Out Drama: "Organ"--WABC 8-8:30. 43-06-15 Wisconsin State Journal - 7 p.m.--Lights Out (WBBM): "Screen Test," a Hollywood story. 43-06-22 Wisconsin State Journal - 7 p.m.--Lights Out (WBBM): "Nature Study," thrilling adventures of a botany class. 43-06-29 Wisconsin State Journal - 7 p.m.--Lights Out (WBBM): attempt of a scientist to murder a dictator in a diving bell. 43-06-29 New York Times- Lights Out Drama: "The Dictator"--WABC, 8-8:30. 43-07-13 Wisconsin State Journal - 7 p.m.--Lights Out (WBBM): "Visitor from Hades." 43-07-27 Wisconsin State Journal - 7 p.m.--Lights Out (WBBM): "Little People," story of professor who murdered and mummified victims in South American jungle heat-shrinking process. 43-08-10 Wisconsin State Journal - 7 p.m.--Lights Out (WBBM): "Sakhalin." 43-08-17 Wisconsin State Journal - 7:00 Lights Out--WBBM WCCO 43-08-17 Tucson Daliy Citizen - What makes a hangman tick and what makes him get genuine enjoyment out of his chosen life work is the subject of "State Executioner" on "Lights Out" presented by Arch Oboler tonight. The hair-raiser has, as its leading character, a man who did the execution work for George the Third of England back in the dark days when heads fell hither and thither from the chopping block. King George's executioner relished his job and it will all be told as only Oboler could tell it. KTUC, 6 o'clock. 43-08-24 Wisconsin State Journal - 7 p.m.--Lights Out (WBBM): "Sub-Basement." 43-08-31 Wisconsin State Journal - 7 p.m.--Lights Out (WBBM): "Immortal Gentleman." 43-09-07 Wisconsin State Journal - 7 p.m.--Lights Out (WBBM): "Lord Marley's Guest." 43-09-14 Wisconsin State Journal - 7 p.m.--Lights Out (WBBM): "V-Day," story of German youth. 43-09-21 Wisconsin State Journal - 7 p.m.--Lights Out (WBBM): "The Producer and the Thing." 43-09-21 San Antonio Light - LIGHTS OUT (7-7:30)--"The Producer and the Thing" is the Arch Oboler hair-raising drama. It concerns a girl script writer preparing a horror scenario, who finds the monster her brain conceived has come to life. 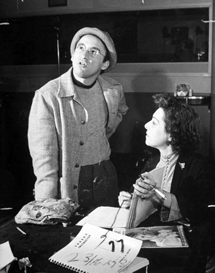 43-09-28 Wisconsin State Journal - 7 p.m.--Lights Out (WBBM): Arch Oboler as himself in "The Author and the Thing." 43-10-05 Wisconsin State Journal - 7 p.m.--Big Town (WBBM): starring Edward Pawley and Fran Carlon in "Voices of Destruction," story of crusading managing editor who smashes Nazi rumor ring. 45-07-07 Wisconsin State Journal - 7:30 p.m.--Prof. Llewellyn Pfankuchen (WIBA): discusses "Making a Charter for the United Nations," under auspices of League of Women Voters. 45-07-14 Oelwein Daily Register - 7:30 Fantasies from Lights Out. 45-07-14 Daily Mail - A Revival of Lights Out at 8:30 tonight for the vacationing Truth Or Consequences. 45-07-14 The Capital - A revival of Lights Out at 8:30 tonight for the vacationing Truth Or Consequences. 45-07-14 Wisconsin State Journal - 7:30 p.m.--Lights Out (WIBA): series returns after several years' absence. 45-07-28 Wisconsin State Journal - 7:30 p.m.--Lights Out (WIBA): "The Rocket Ship" by Wyllis Cooper. 45-08-04 New York Times - 8:30-9--Lights Out Fantasie: "Lady From the Lake"--WEAF. 45-08-11 Wisconsin State Journal - 7:30 p.m.--Lights Out (WIBA): "Did the Murder Happen?" 46-07-06 Wisconsin State Journal - 8 p.m.--Lights Out (WMAQ): return of series, dramatizing legendary tale of the young Jew who scoffed at Christ at the crucifixion and who was doomed to wander the world forever. 46-07-13 Wisconsin State Journal - 8 p.m.--Lights Out (WMAQ): "Coffin in Studio D."
46-07-20 Wisconsin State Journal - 8 p.m.--Lights Out (WMAQ): "The Haunted Cell." 46-07-27 Wisconsin State Journal - 8 p.m.--Lights Out (WMAQ): "The Battle of the Magicians." 46-08-03 Wisconsin State Journal - 8 p.m.--Lights Out (WMAQ): "Hindu Revenge." 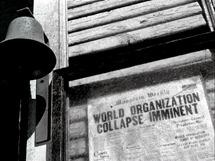 46-08-10 Wisconsin State Journal - 8 p.m.--Lights Out (WMAQ): "The Ghost in the Newsreels." 46-08-17 Wisconsin State Journal - 8 p.m.--Lights Out (WIBA): "A Case of Self-Conviction," story of a fugitive who seals his own doom. 46-08-24 Wisconsin State Journal - 8 p.m.--Lights Out (WIBA): Nelson Olmsted in Dickens' "The Signal Man." 47-07-16 Wisconsin State Journal - 8:30 p.m.--Lights Out (WENR): returns to the air with Boris Karloff. 47-07-23 Wisconsin State Journal - 8:30 p.m.--Lights Out (WENR): tale of a vampire. 47-07-30 Wisconsin State Journal - 8:30 p.m.--Lights Out (WENR): Boris Karloff and a disappearing hand. Wyllis Cooper, a writer of eerie, sometimes incomprehensible though remarkably literate radio and television dramas looks as if he'd stepped out of one of his own scripts. He's a short, bespectacled man, broad of brow and sweeping of girth. His double chin is an expanse of incomparable grandeur. He works, hunched over a typewriter like an intelligent spider, in a large office in the Hotel Brittany behind drawn blinds. The drawn blinds, he explains, are to protect him from street noises, which is the sort of contradiction he loves to use in his radio plays. After his single brush with television, a six-program series on ABC-TV entitled characteristically Volume 1 (Nos. 1 to 6), he is brimming with theories about television, most of them heretical. Television, he says, is neither a movie nor an illustrated radio show. Too much television, he feelsl, is just a bad adaptation of Hollywood techniques with cameras running wild all over the place. Television, says Cooper, is really a window in your living room and should be treated that way. In his own series, Cooper tried to get the home audience to forget all about the cameras, to become eavesdroppers. The audience was told in the first of the plays, that it was seated behind a mirror. The audience could see every move of the characters; the characters, of course, could see only their own reflections in the mirror. Into the room--a hotel room--crept a man and a woman who had just robbed a bank and were using the place as a hideout. The camera never budged throughout the half hour. The woman would tidy her hair in front of the mirror--which was your television screen--then walk away. The man would stamp out a cigarette on an invisible bureau over which the mirror hung. An ordinary kitchen chair was the only prop. There was no scenery. The room was black as a cave except for spots illuminating the actors. Gradually, the couople became aware there was something very fishy about the hotel room. The bellhop, the only other character, seemed to know all aobut their crime and to pity them for it. Their money disappeared. They couldn't get food or, a more desperate need, cigarettes. And they couldn't get out of the room. Finally--if my interpretation of the convolutions of Cooper's brain is correct, and I wouldn't swear to it--they realized they were doomed to spend eternity in that hotel room with a neon light flashing off and on, off and on, outside the window and a jukebox playing the same dreary tune down stairs. It's a torment I wouldn't wish on my worst enemy. That is typical of the stories Cooper tells and also of this methods. He used no scenery in four of his six plays and only rudimentary scenery in the other two. The purpose was not to save money. The televisionscreen is so small, he says, that the viewer can't absorb the scenery and also see what the people are doing. He uses small casts because he thinks too many characters clutter up the action. As in radio, he was spate with dialogue. Cooper feels there is too much chatter in television. Yet the first script totaled 74 pages, two-thirds the length of a two-and-a-half housr play. Most of it was stage directions. Cooper is trying to establish on television the intimacy that was radio's peculiar distinction among dramatic forms. He admits it's difficult, but he says that the imitation of movie technique is the wrong way to go about it. "The movies can go into great detail," he points out. "In television, we can't. We haven't the time, the clarity, the size, or the Audience stimulation." (Audience stimulation: people in an audience stimulate one another. Two people in a living room don't vary much.) On the other hand, television has an urgency and a freshness that can't be duplicated by the movies. Cooper used to writer his little vignettes and throw them in front of the camera--three one-hour reading periods, six hours for rehearsals--before he had time to grow cold on the. 1937 Magic Key of RCA. 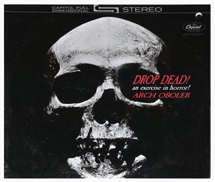 As late as 1962 Arch Oboler and Capitol Records teamed to create a fascinating compilation of Oboler's scarier productions.